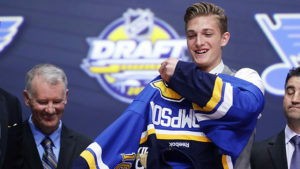 The St. Louis Blues selected forward Tage Thompson with their first round pick at the 2016 NHL Draft in Buffalo. Thompson, who is the son of former Peoria Rivermen assistant coach Brent Thompson, said he met with the Blues several times prior to tonight’s draft. “This is something I’ve dreamed of my whole life,” Thompson said after the draft.